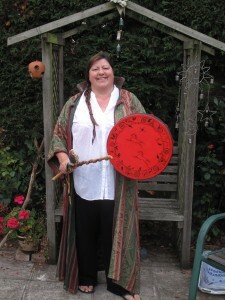 Empowering woman – The shamanic way. Calling any woman who has ever felt dis-empowered or victimised…please take heart…there is another way. I know, from personal experience of turning my own turbulent life around and walking the way of beauty that transformation is not only possible, but essential for our well-being and the well being of all those we love. But make no mistake, this is often a tough path to walk, leaving behind people-pleasing and toxic relationships, but ultimately for me, it was the only way forward. Having found peace and comfort from doing inner work, I dreamt of a way to create a group for empowering, healing and honouring all women. A sacred space to support and encourage one another in a good and loving way, a circle of equals without egos, with accountability and passion. I asked spirit to show me how. Empowering woman was the answer. The principles of Empowering Woman encourages us to honour and respect not only ourselves but everyone and everything that crosses our path. There is no room here for idle gossip and self pity. Walking in beauty is the way. I feel compelled to be in service, to pass on my knowledge, wisdom and understanding to like minded souls, so it made perfect sense to create this wonderful opportunity for a circle of women; a circle of empowerment. Times are changing…some say there is a quickening, an urgency for us all to make a shift. There was much speculation about the 2012 prophecy. Personal, I believe that what we are being called to do is make a shift from our Heads into our Hearts. From a thinking consciousness into a heart felt consciousness. Stepping up and into who we truly are is the beginning. Our circle meet approx every 3 months, to come together in a supportive, transforming and sacred way, to dive deeper into the vital inner work that we all need to do if we are to step into our full and most authentic power. Along the way we may; dissolve the barriers which create separation and angst, rediscover our authentic voice and feel safe to speak our truth, be inspired and access creativity in a nurturing and loving circle of equals…care to join us? Some of you will know intuitively that joining this group is just what you’ve been waiting for.. Others may be a little unsure…Is Empowering Woman or The Shamanic Way the right path for you? Let’s speak on the phone :01243 512225 and between us we’ll unearththe truth! Shamanism is an ancient spiritual tradition found in most indigenous cultures and may be the oldest form of human healing. Respecting all forms of life and nature. It would appear that shamanism is wired firmly into our human psyche, feeling deeply familiar at an ancestral level, although not always remembered in the present consciously. This is perhaps why it is often experienced as a spiritual homecoming. Shamans are considered to be intermediaries or messengers between the natural world and spirit worlds. They can treat ailments and illness by mending the soul. Alleviating traumas affecting the soul or/and spirit enables the physical body to undergo balance and regain wholeness. Within the shamanic practice there are a set of tools that can be used in many ways to assist this personal healing and spiritual growth. I do not call myself a Shaman or pretend to be something that I am not, I simply had a deep desire to share with other women the teachings and experiences that have helped shape my life. I have many years studying the shamanic arts plus a therapeutic training in psychology and counselling which is continuous. I also offer energy medicine, earth medicine, animal medicine in fact I teach about the connection of everything! I’m truly passionate about empowering women, believing that when nurtured, strength laced with vulnerability, Empowered Women can only be for the greater good of all humanity. As mothers, daughters, sisters, lovers, wives and grandmothers we will become more loving, more effective and so much happier when we step up and into our full power!